Inspired by the Manhattan Bridge, the Townsend Freestanding Tub was designed with contemporary clean lines and expert craftsmanship. The uniquely designed "3-sided" freestanding tub can be installed against a wall to save on space or as a true free standing tub. Design versatility extends to the compatible tub fillers and can be installed with a free standing tub faucet, wall spout or deck-mount tub filler. Completing the Townsend suite, the freestanding tub coordinates beautifully with the design matched toilet, sinks, accessories, furniture and faucets. Overflow cover and drain kit sold separately (1582000). With an organic oval shape inspired by clay pottery, the Abrazo bath makes a striking focal point for your contemporary bathroom. The unique solid-surface material has the attractive matte finish of smooth stone but feels warm to the touch and is easy to clean. An integral slotted overflow allows for the deepest possible water level, and a center toe-tap drain with cover completes the stylish design. With two distinct bathing wells of different depths and a cool-off area, this whirlpool lets you create your own home-spa experience for two people. Individually adjustable jets, effervescence ports, and two sets of back jets offer a range of options for gentle or invigorating water massages suited to each bather. Chromatherapy lights permeate the bath while allowing you to change the atmosphere as you please. Archer 5 ft. Left Drain Soaking Tub In White Taking its design cues from traditional Craftsman furniture, the Archer line of baths reveals beveled edges and curved bases for a clean, sophisticated style. This bath offers a low step-over height while allowing deep, comfortable soaking. Lumbar arch gently support the natural curves of your body. KOHLER ExoCrylic is the next generation of bathroom acrylics, featuring a lighter weight for easier installation and 90% fewer VOCs produced during manufacturing. 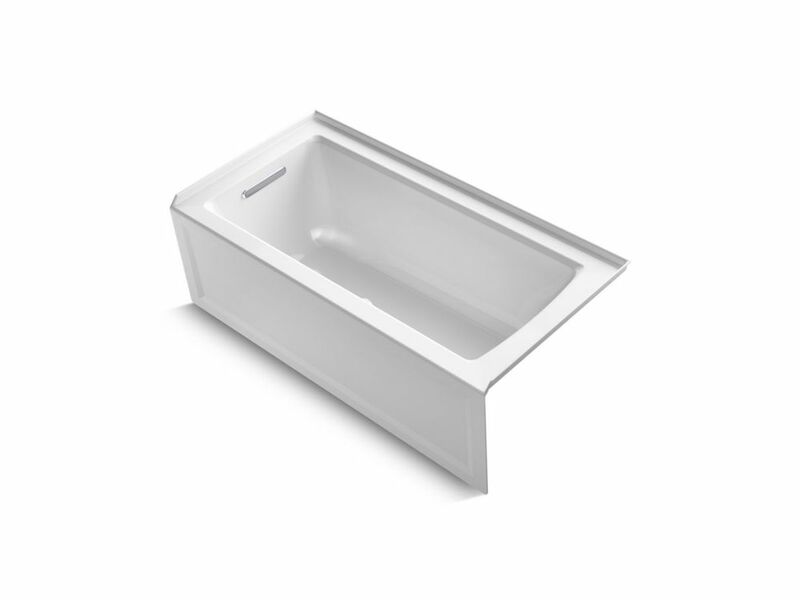 Archer 5 ft. Left Drain Soaking Tub In White is rated 3.6 out of 5 by 18. Rated 3 out of 5 by John from It is a standard tub at a good price. ... It is a standard tub at a good price. Rated 5 out of 5 by Tanita75 from Magnificent! Archer 60"" x 30"" alcove bath with integral apron integral flange and left-hand drain. This tub is beautiful, lightweight but sturdy. It's simply magnificent. The fit and finish are high quality. We are extremely pleased with the overall quality of this product.